As China’s financial core and largest city in the country, Shanghai serves the average visitor with both fascination and a slew of colorful experiences during both day and night. If you would like to experience a tour of this wonderful city, request a quote from this page and I would be happy to tell you all about what Shanghai has to offer. Including the mix of both old and new at the world famous Bund, which showcases a waterfront promenade lined with colonial-era buildings, which ultimately faces the modern landscape of the city known to be a technology hub of East China. Worried about what to eat if you’re not use to China’s local cuisine? Even as Shanghai is among some of the finest dining in the country with equally excellent service, they have a downtown that will fill your bellies with the western food that you had left behind before your trip. where you can examine art that goes back thousands of years in a building that is considered China’s first world-class modern museum. If art doesn’t peak your interest, head to Disneyland Park theme park, which just opened in mid-June of 2016 and has already attracted over one million visitors from around the globe. As the city sets to influence the rest of the country and modernize it, it is also known as “oriental Paris” and serves as a shoppers paradise for those with fashionable and modern tastes. 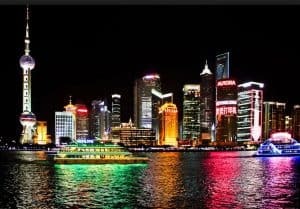 At night, we can head over to the Bund or enjoy a cruise on the Huangpu river to watch the shimmering, colorful lights of Shanghai’s buildings glowing bright by the water. Shanghai is the biggest Chinese city by population and the largest city populace by populace in the world. It is one of the four direct-controlled districts of the People’s Republic of China, with a populace of more than 24 million. It is a worldwide financial center, and a transport point with the world’s busiest container port. Located in the Yangtze River Delta in East China, Shanghai sits on the south edge of the mouth of the Yangtze in the center segment of the Chinese coast. The region borders the areas of Jiangsu and Zhejiang toward the north, south and west, and is limited toward the east by the East China Sea. For quite a long time a noteworthy administrative, shipping, and trading town, Shanghai developed in significance in the 19th century because of European acknowledgment of its great port area and financial potential. The city was one of five opened to foreign exchange taking after the British triumph over China in the First Opium War while the resulting 1842 Treaty of Nanking and 1844 Treaty of Whampoa permitted the foundation of the Shanghai International Settlement and the French Concession. The city then prospered as a focal point of business in the middle of east and west, and turned into the undisputed monetary center of the Asia Pacific in the 1930s. However, with the Communist Party takeover of the terrain in 1949, exchange was reoriented to concentrate on communist nations, and the city’s worldwide impact declined. In the 1990s, the financial changes presented by Deng Xiaoping brought about a serious re-improvement of the city, helping the return of finance and foreign venture to the city. To hire a Shanghai tour guide just fill out the form on this page to request a free quote.